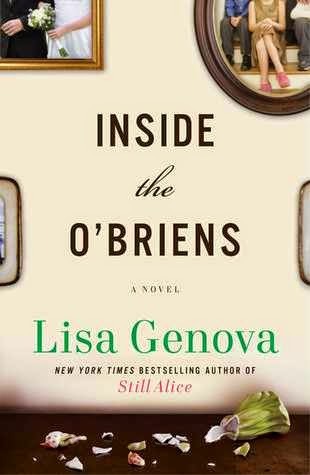 From the New York Times bestselling author of Still Alice Lisa Genova comes a powerful and transcendent new novel about a family struggling with the impact of Huntington’s disease. I remember years ago hearing about a book that was self published (no one wanted to take a chance on it), but it ended up winning a number of awards - that book was Still Alice by Lisa Genova. I think it was one of the first books I read in less then 24 hours. Such an emotional story that I hestiated reading her next 2 books - could my heart handle the emotion she invoked? When Inside the O'Brien was available on Netgalley I figured I was able to handle another dose of her emotional writing (bear in mind that I mean all this in a very good way). In the end I opted for the audio version (via Audible). The audio was phenomenal and I am so glad that I went that route, the reader evoked a pace and tone that brought this story to life. The story begins by spending some time introducing the reader to the O'Briens, getting to know this family, what makes them tick, their beliefs and Irish heritage with subtle hints that all is not right with the patriarch Joe. Having never heard of Huntington's Disease before I found this an education lesson but not in a clinical manner. Told mostly through the POV of Joe and his youngest daughter Katie the author managed to make this reader feel empathy for the whole family. With various reactions to being tested you can see each side and their reasonings. As I got closer to the end of this book I wondered how the author could pull it off without disrupting the flow of the story, I was not disappointed it was a fitting end. Written with authentic and believable reactions this emotional book is a reminder that we aren't guaranteed tomorrow, love today, enjoy life because you never know what the future holds. Guest Post with Anna Belfrage "And Then What?"